Hello! I’m Danielle from TeachNouvelle, and I’m so excited to be here today on Minds in Bloom. I love Rachel’s dedication to creating rigorous resources for students, and I always keep rigor in mind when creating and teaching, too. Today, I want to share what I’ve learned about Blizzard Bags. Even though some of us haven’t even said goodbye to summer yet, it’s not too early to start thinking about snow. 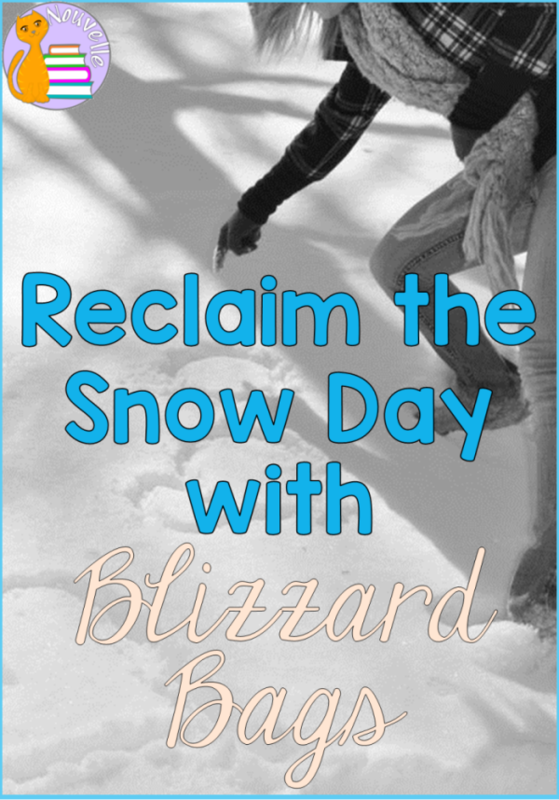 A snow day can be a great thing, especially in the late winter months. But six in a row? Ten? That’s when we start panicking about how to keep kids on track to meet learning targets by the end of the year. We all know that tacking on a day or two or six at the end of the year is a joke, so is there a better way to keep kids learning through bad weather? A Blizzard Bag is a take-home activity that can replace a classroom day in the event of bad weather. Many districts across the United States (particularly in the Northeast and in the Midwest) have adopted eLearning days to help promote student engagement during a long stint of winter weather. Basically, they are trying to prevent prolonged winter events (Boston, anyone?) from extending the school year by two weeks or even a month in some places! Each classroom teacher can submit a certain number of eLearning lessons, and students can complete them when school is cancelled. Many districts agree on five eLearning days before they start adding bad weather make-up days. And, honestly, even if it’s not a district mandate, it’s not a bad idea to have a few take-home lessons for your students. You can design your lessons to be submitted electronically, or you can send kids home with a packet. I like the idea of packet work because it can’t be disrupted by power outages. Use this opportunity to get your students to learn, create, and have fun! As tempting as it is to send students home with test prep, we can’t use this opportunity to dump activities on them that we already find boring in a classroom setting. Blizzard Bags need a special spice, since students won’t have the energy of the classroom to motivate them. These activities also need to be specifically designed to be non-threatening to struggling readers. Remember, you’re not going to be there to help your students, and you don’t want them to give up before they’ve accomplished anything. 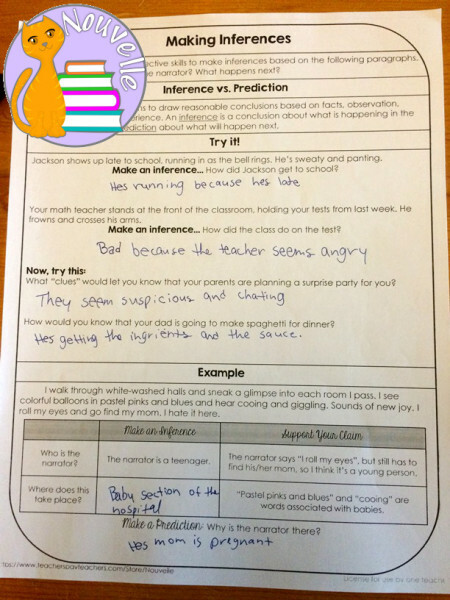 For example, this Making Inferences activity presents several puzzles, and students get to figure out what’s going on. These begin as heavily-scaffolded and move to more complex tasks as students hone their skills. Each puzzle is meant to be intriguing so that kids are hooked and want to continue. You can use this out-of-school opportunity to reinforce skills like identifying (and using!) direct and indirect characterization, using context clues, and so much more! Each activity is designed to take about an hour, making it easily accomplishable in one or two sittings. Once again, you don’t want to send kids home with so much work that they don’t do any of it. Also, even if the district declares an “eLearning day,” kids are still going to want to spend some time having fun in the snow. 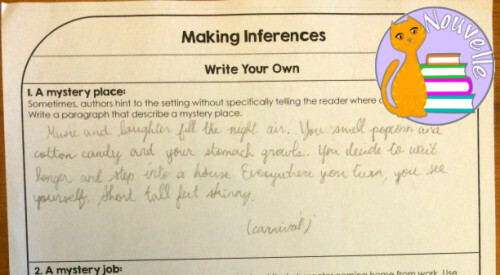 Here’s an example of the puzzle paragraphs from Making Inferences. Each paragraph will take students about five minutes to read actively and annotate. This kind of chunking also makes it easy for students to take breaks. These activities specifically target skills that students are acquiring during the school year. This isn’t the moment to introduce new skills but rather to reinforce what students are already learning. In the reading section above, students practice RL.1 as they draw conclusions based on textual evidence and support their claims. In the writing portion (making their own puzzle paragraphs), they practice W.3. This is the perfect opportunity to get some more practice on a troublesome standard. You also need a way to assess the final products. When students come back to school, how are you going to grade their work? 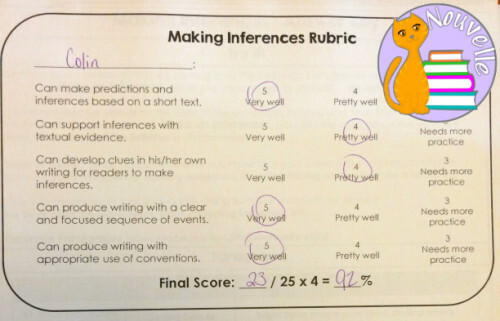 I strongly suggest designing rubrics using “I Can” statements, as shown here. You can use these rubrics as a self-evaluation, peer-evaluation, or teacher-led evaluation tool. You can also grade the work using Peer Grading. Students love sharing their writing with their classmates, so why not have a sharing day when you return to school? Blizzard Bag learning can stretch back into the classroom to promote even more practice! The other great thing about collecting high-quality, independent activities is that they are versatile. If you’re lucky enough not to need them during the winter, you can use them for sub plans, enrichment, or summer packets. Thanks again to Rachel at Minds in Bloom for giving me this opportunity to guest post. Hopefully, it has given you ideas about how to reclaim bad weather days. Danielle has taught in Oregon, North Carolina, France, and Germany. She is a military spouse, an avid reader, a cook, a sometimes-runner, and an armchair psychologist. 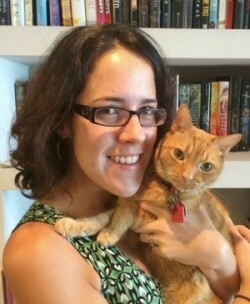 She lives in Puerto Rico with her wife and their adorable cat, Crookshanks. You can visit her blog, TeachNouvelle, and her TeachersPayTeachers store. If your life needs more pictures of cats and books, then follow her on Instagram.